We develop proposals in a coordinated way working with you to ensure that the opportunities and constraints are fully appreciated and the evolving design is fully understood. 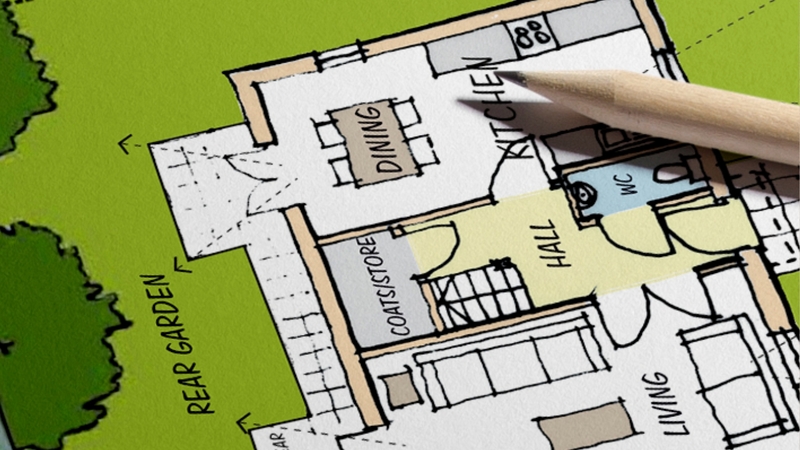 Once a final design is reached, preparation can be made towards submitting a detailed planning application. The process is simple - we compile our ideas from our initial consultation to fit within the context of the survey and share these with you to review and comment. If the proposal is not exactly to your requirements, we will develop further options until we have reached a viable solution. How long do we have review the proposed sketch design options? You can take as long as you like to review the sketch options we send to you, however in order to keep project momentum, we would expect comments back with in 5-7 days. The sooner we can finalise a proposal, the quicker we can submit an application on your behalf. 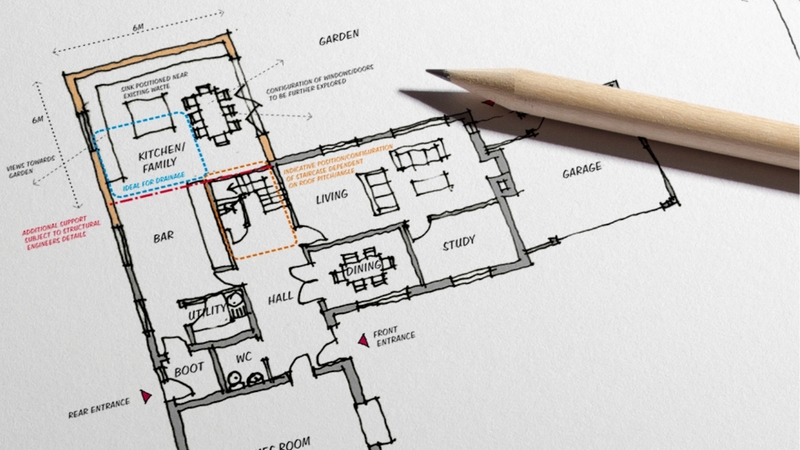 Sketch illustration drawing of the proposed floor plans for a two storey rear extension to accommodate a large open plan kitchen and dining areas with a new master bedroom and en-suite bathroom at first floor. 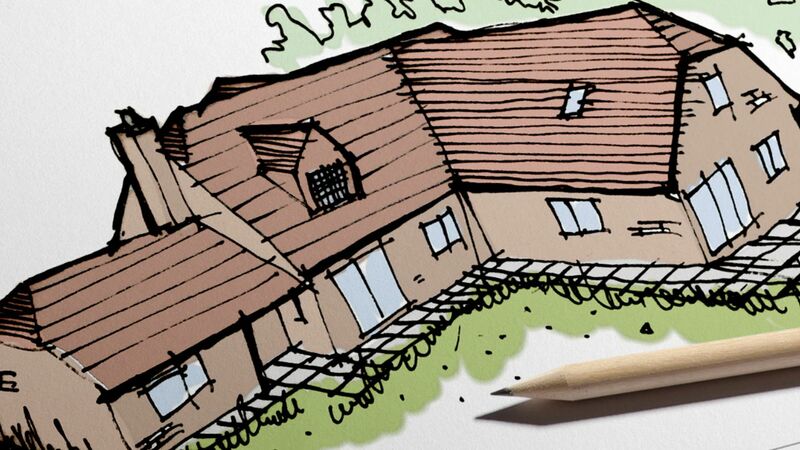 Sketch illustration drawing of how the proposed extension will look externally against the existing house. Sketch illustration drawing illustrating part of the proposed floor plans for a new four bedroom home to be submitted as part of a pre-application to the council. We require changes to the sketch proposal, how do we go about this? If you require changes to the drawings, the quickest and easiest method is to print off the drawings and draw on the changes. Once you have drawn the changes on the drawing, you can either scan the changes or take a photo using a smart phone and send by email, text message or even WhatApp. This process should take no longer than a couple of minutes but will ensure us we are working along the right lines finalising the drawings for an application. 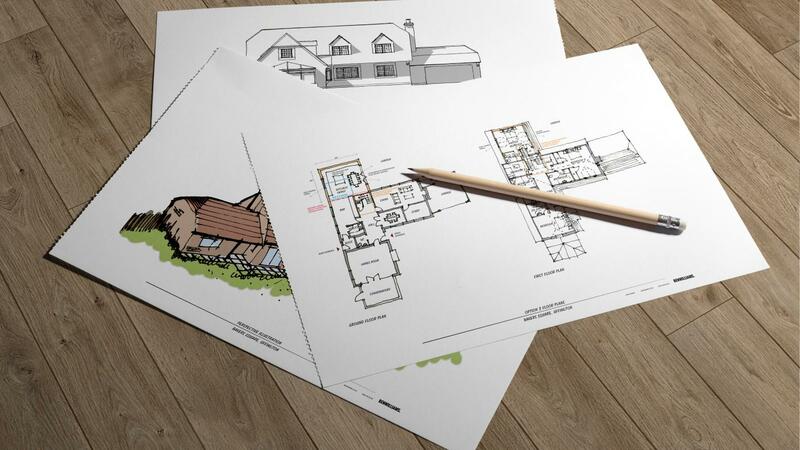 Once a sketch proposal is finalised, we can either submit a pre-application enquiry or develop the proposal further to enable the scheme to be submitted as a detailed planning application. Most household extensions do not require a pre-application but there is the option should you wish to pursue. If the proposed works are complex in nature, it maybe a beneficial expenditure in undertaking pre-application discussion with the appropriate Local Planning Authority. This will provide an officers view of the proposals to outline any issues that may hinder submitting a detailed planning application. This would incur an estimated timescale of 21 days for a formal response to be received from the planning officer.